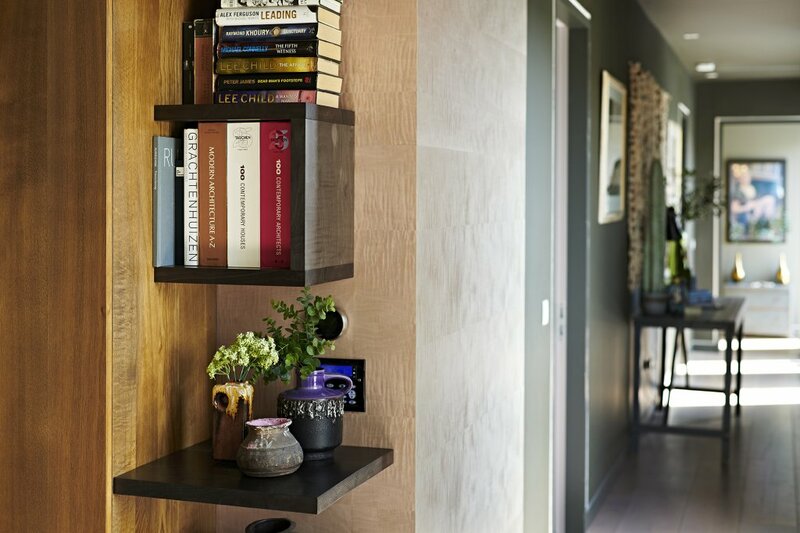 In this, our second feature case study on Bliss Blakeney, we look at the design ideas behind the project with a focus on the living spaces, hallways, library and bar. The first Bliss case study concentrates on the award-winning kitchen which can be found by clicking here. 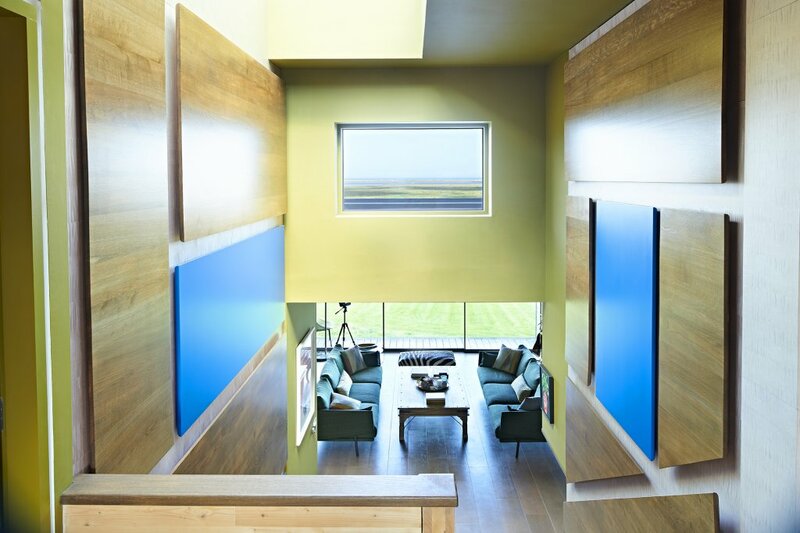 Bliss Blakeney is a striking piece of contemporary architecture sitting in 16 acres of the North Norfolk coast with direct views across the salt marshes and Blakeney Harbour to the North Sea beyond. Its low profile, cross laminated timber construction designed by architects Waugh Thistleton, nestles into the landscape really beautifully, however nothing quite prepares you for what happens on the inside of this home and our contribution to it. All the projects we make are collaborative to some degree, but Bliss is one of those projects where we became part of a very creative team, working closely with the clients, Daniel & Lisa Broch, to translate their striking ideas into reality. Despite having not done work exactly like this before, they recognised the right kind of drive and creativity in what we do. Right from our initial discussions it was clear that this was going to be an exciting project; the kind of thing as designers, we dream of: full of colour, texture, new materials and innovative design solutions. The first areas we were asked to look at were the hallway and stair panelling and upstairs library; key spaces that create first impressions as you walk into this extraordinary home. The hallway panelling seemed like a rather unglamorous place to start given all the other spaces we were being asked to consider, but Daniel & Lisa’s take on panelling was anything but ordinary. In fact what they were looking for was a piece of artwork integrated into the architecture of the building. 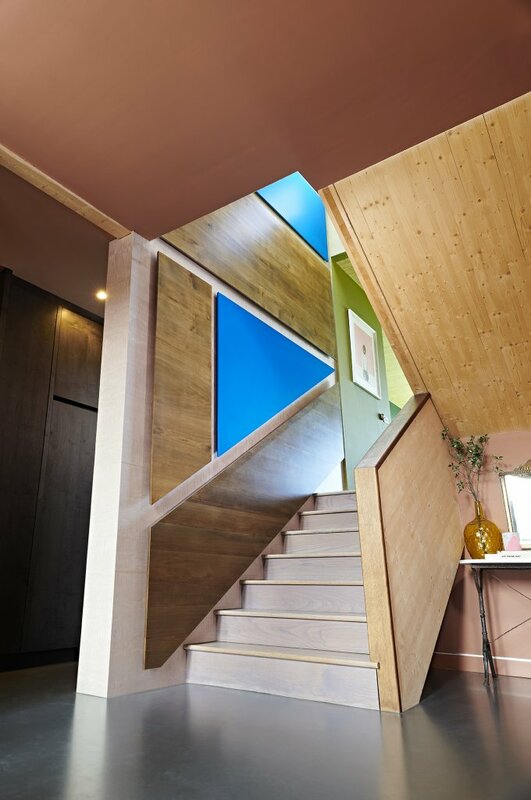 What’s more, this installation needed to serve as the handrail for the stairs, so there were practical considerations here as well the creation of a ‘wow’ factor piece. ‘Panelling’ can mean all sorts of things, usually something woody and traditional, but this was going to be colourful, modern and dramatic: a modern, architectural-scale ‘Mondrian’ of squares and triangles. Technically what we came up with was complex, the square and triangular panels were the size of large dining tables suspended up to 20 feet above a deep stair well. 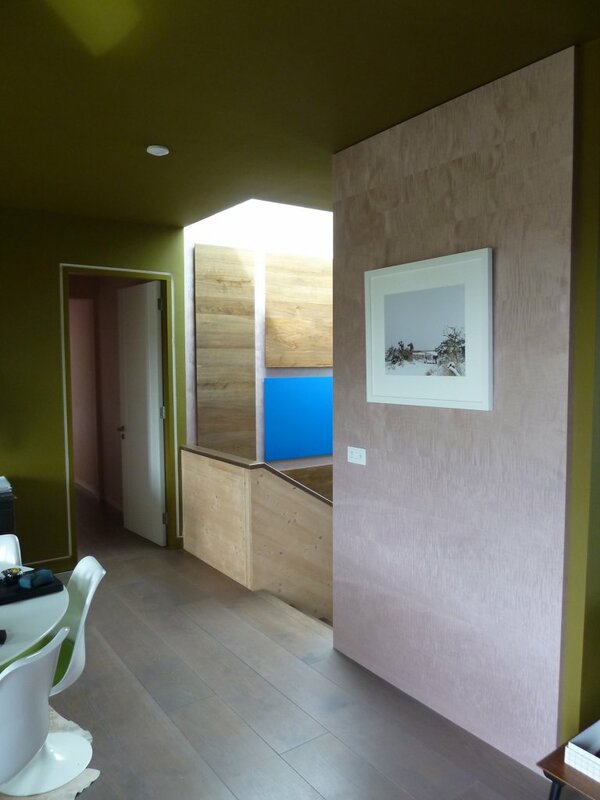 What’s more we had to clad both walls in timber frameworks then pink panelling to create a base before hanging the feature panels of varying depths upon that. 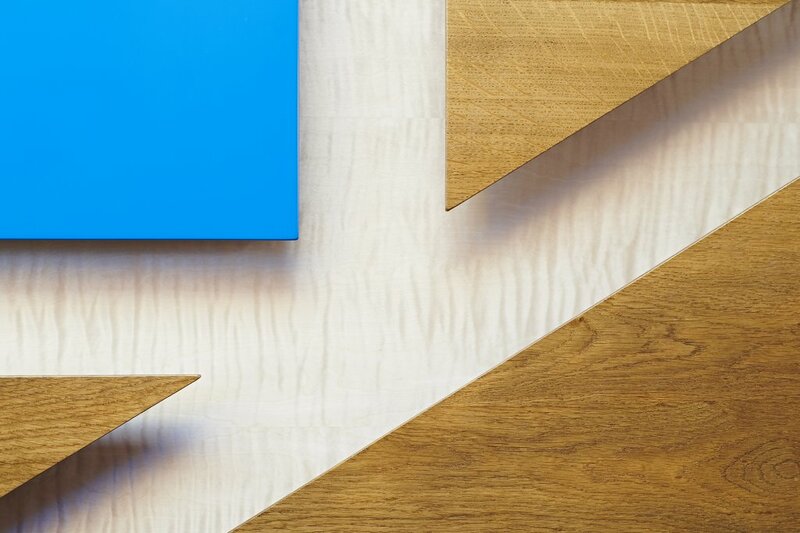 As with so much of what we do as designers and makers, making something look simple is often technically very challenging. 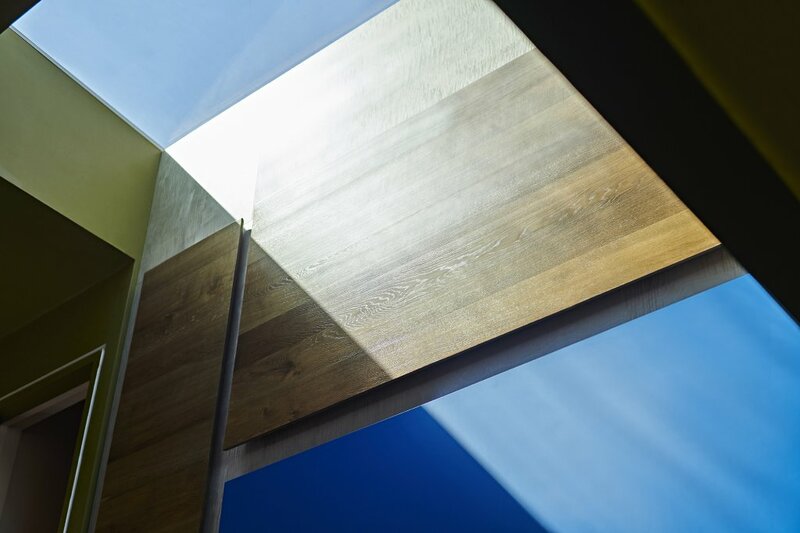 The three-way colour scheme consisted of a wall of pink figured sycamore with cobalt blue and fumed oak panels. 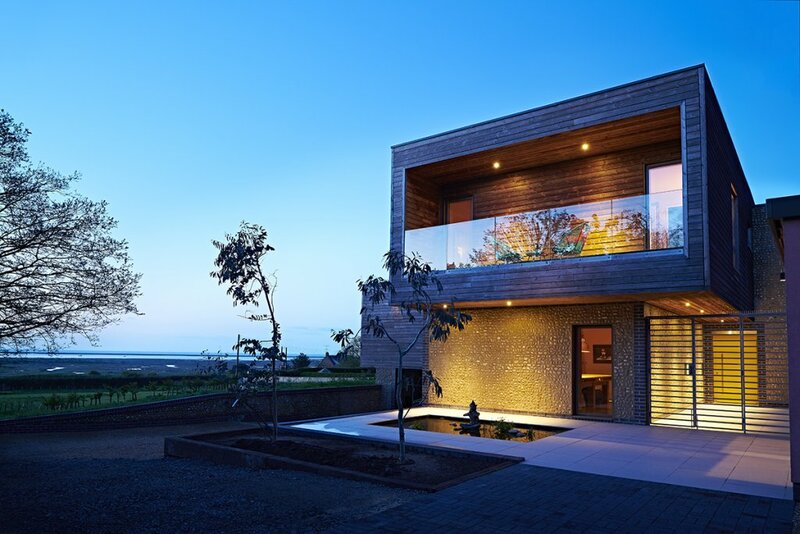 It’s like an enormous abstract landscape painting, monumental in size, part of the building itself and connected to the wider land, sky and seascapes through the openings of windows and roof lights. We were faced with lots of details to resolve including how the pink panels finished on corners which, if not considered, could have led to awkward junctions with the architecture. So, with the clients, we came up with long over-running corner wraps in the pink material. This detail of the wrapped corners was repeated in other spaces, but it also worked as the visual continuation of the theme we established on the stairs into the next space: an open library and living space upstairs. This installation also has a back wall panel of pink sycamore which wraps around a corner and the large unit that sits in front of it is one of my favourite elements at Bliss. It had to be multi-functional, combining a library, TV & media cabinet, display shelves and storage unit and once again the outcome is rather abstract in terms of form, materials and colour, but utterly beautiful. It is full of intricate detail and like nothing else we have done: it’s a snug space to watch TV, listen to music or just to relax with a magazine. Despite Bliss being a large house it’s full of intimate spaces like this. I think this one is particularly successful, a lovely combination of our furniture and the client’s collection of contemporary art, classic modernist sofas and quirky colourful objects that can be found throughout the property. Current interior and furniture trends tend to push us towards a minimal expression of colours – lots of greys, blacks and muted timber tones. Although we use those colours and materials here, you certainly can’t call Bliss monotonal or minimal! Halfway back down the stairs is a large mezzanine living space called ‘The Sea Room’. I think this room more than any other captures the spirit of Bliss and is the expression of Lisa and Daniel’s lifestyle. The Sea Room has a completely glazed wall which opens up onto a balcony with staggering views over the salt marches and wildlife reserve. Though our contribution to this room is relatively small; the stair wall panels lead into this space perfectly from both the ground and first floors, we also made the key bar area. 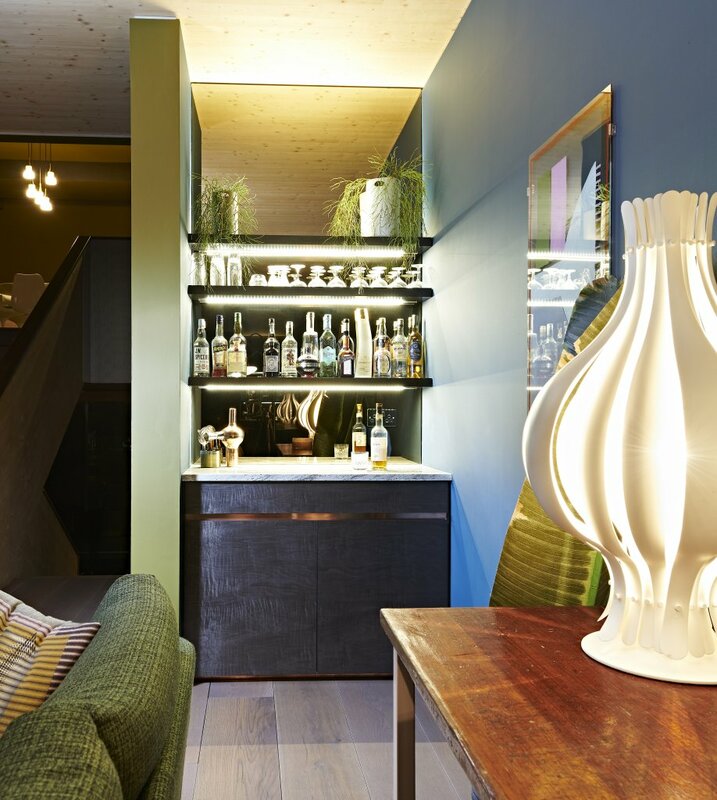 Although small, the bar really comes to life at night through the lighting, colour and reflective mirror and glass material palette. It is made in charcoal grey sycamore, copper and fumed oak but here is surrounded by rich blues and greens. 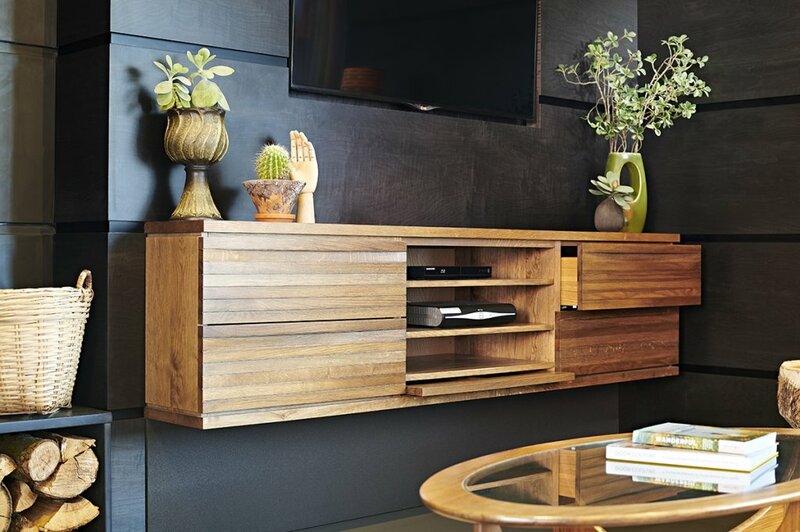 This piece starts to pick up on the materials we use downstairs in the living kitchen and snug areas – but more of that in a moment. Like the mezzanine Sea Room itself, the bar acts as a transition piece / space. So let’s talk about that material palette. In terms of timber surfaces we used two dyed figured sycamore veneers: a light pink and dark charcoal grey. The figured sycamores have a lovely subtle silky surface, which in different lights come to life, almost looking like moving water. We also used solid oak throughout the project but this was fumed to a dark grey/brown. The wall panels also included a vibrant blue-sprayed surface. We incorporated copper and stainless steel into some elements. That’s it, fewer materials than you might think looking at the images. It’s the way we used and mixed them that I loved, creating relationships between the spaces and hinting what’s to come in a following room. Tone, shade, colour and texture was consciously selected to work with the interior decoration and architecture, but also with Norfolk coastal landscape’s light and hues outside. The final space to talk about is the downstairs living area. A large open plan space with sliding fully glazed walls on either side, it contains the ‘snug’ living space, a dining area and the kitchen. As the kitchen is already fully covered in the Bliss case study – part 1, let’s focus on the snug living room area. 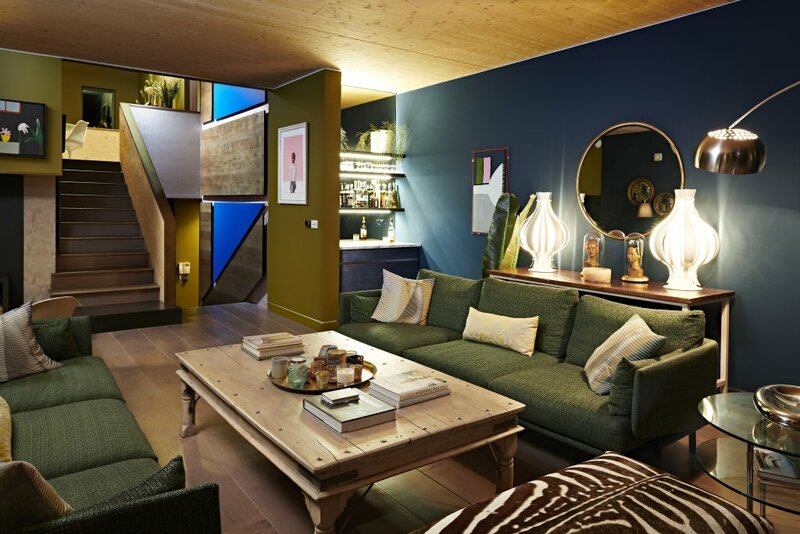 Like upstairs it utilises existing retro furniture pieces to add some cool colour and comfort. Our job was to once again wrap the space in panelling to make it feel intimate and cohesive, incorporating the TV, media cabinet and cassette fireplace, whilst also making space for some key art works. And it was also going to be black… or at least our charcoal grey figured sycamore! That included the walls, ceiling and the corner ‘wrap-arounds’ into the hall space. It did need some detail within that dark surface though so we included a repeating horizontal 30mm shadow detail between each panel giving it the scale and feel of exterior architectural cladding brought to the inside. Around the fireplace we were able to use slate providing a perfect colour match to continue the panels in a fire resistant material. Our work helped to disguise some awkward junctions in the building’s CLT panels and unify them to create a cohesive space. 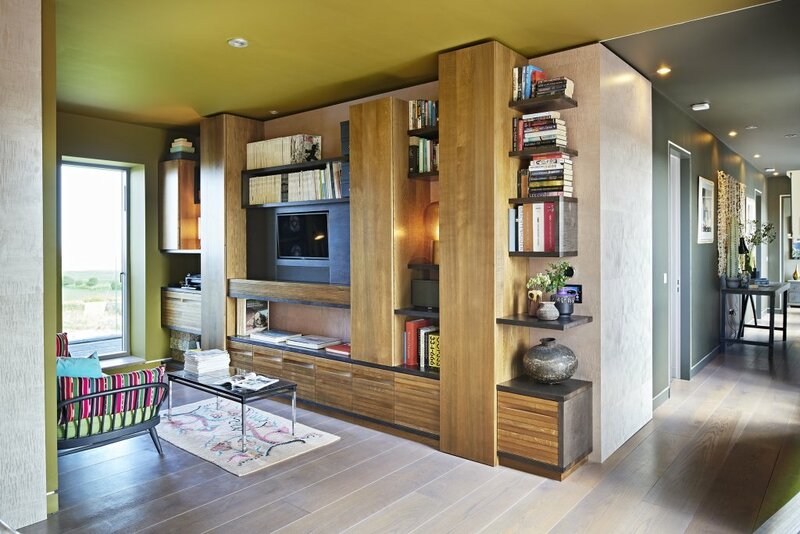 I particularly like the built out area around the large TV and which includes the slotted-in letterbox-shaped fumed oak media cabinet below. We also hid all the speakers at floor level behind a grey/black fabric panel making them all but invisible. 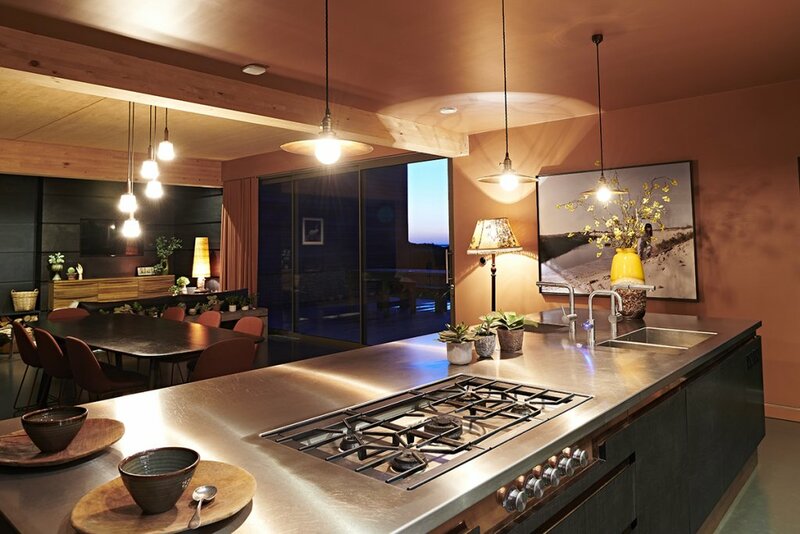 Of course, the snug is part of a much larger space that incorporates the award-winning kitchen, and there is a lot of crossover in terms of the design themes and materials of these two key elements of the Bliss interior. The polished concrete floors and painted wall colours do their bit to unify as well. I’m sure most people would baulk at the idea of a 5 sided black box as a snug space, but it’s a sign of the confidence of the design relationship we built up with the clients and their own sense of the objects, artwork and furnishing they placed in the space that really make this work so well. Bliss is a reflection of the clients’ lifestyle and characters. It is a family home and an entertaining space for lots of people. 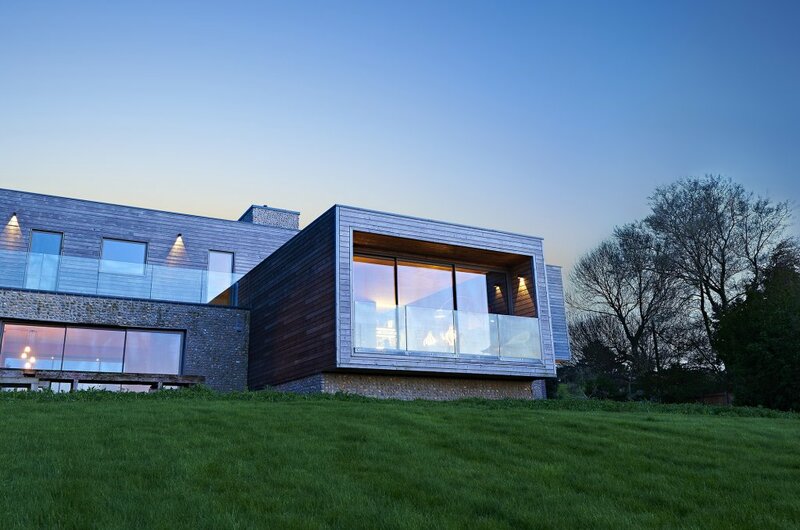 It successfully manages a fine juggling act: contemporary yet comfortable, large yet intimate, warm and enveloping inside yet inextricably linked to its beautiful but sometimes harsh environment of the North Norfolk coast outside. Breaking News! We are very excited to announce that the Bliss Kitchen has won the Designer Kitchen & Bathroom Awards – ‘Kitchen Design of the Year (Over £25k)’. It’s the major industry award and Simon Thomas Pirie have won it at their first attempt against much larger and more established kitchen brands. To find out more about the awards and who won in the other categories go to the Designer Kitchen and Bathroom website.